Star’s Hitch | News and Features | Style Weekly - Richmond, VA local news, arts, and events. Gov. 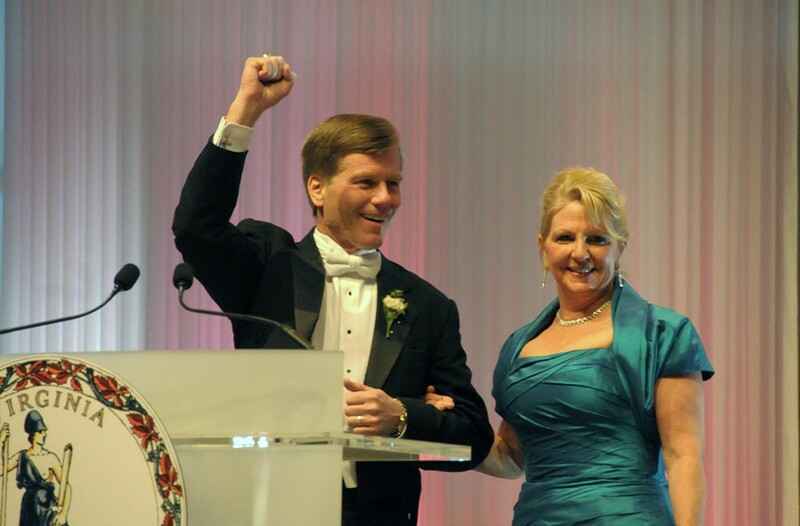 Bob McDonnell and his wife, Maureen, at the governor’s inaugural ball in 2010. Tucker Martin seemed perplexed. The communications director for Gov. Robert F. McDonnell had learned in the summer of 2011 that the governor might attend a function for a fledgling dietary supplement maker named Star Scientific at the Executive Mansion. "I don't understand this? we are doing an event with them?" Martin wrote in an email obtained by The Washington Post. Another top aide, Matt Conrad, quickly wrote back, "You were exactly right to be suspicious." The event, which coincided with the launch of Star's new product Anatabloc took place as planned Aug. 31. McDonnell attended at the insistence of his wife, Maureen, who'd promoted Star's products at other events, although the governor faced far more pressing problems in the aftermath of Hurricane Irene, which tore through Virginia just a few days before the luncheon. This behavior begs a question that has dogged the first family: Why were the McDonnells so enamored with financially troubled Star and its hard-charging chief, Jonnie R. Williams? The glib former salesman had donated thousands of dollars to McDonnell's political efforts, paid $15,000 for a daughter's wedding meal that June and had loaned a vacation home, Ferrari and Land Rover to the McDonnells. Williams' largesse has touched off probes by the FBI and the Richmond Commonwealth Attorney's Office. The governor, after all, is well-educated. He has business degrees from Notre Dame and Boston University. He served as attorney general before being elected governor in 2009. The prominent Republican has handled donations from many sources, including Altria, Dominion and other heavy hitters. None has brought him more grief than a little tobacco company in search of new products that has been so financially challenged that it has lost a whopping $231.5 million during the past decade, according to its filings with the U.S. Securities and Exchange Commission. Questions abound about Williams, who got his start selling used cars and real estate in his hometown of Fredericksburg. A marketing wunderkind, he was rich enough to drive a gold Mercedes and own two homes by the time he was 24, according to the Fredericksburg Free Lance-Star. With no apparent health care training, he moved on to selling various eye treatments before starting Star in the 1990s. Along the way, he got into trouble with health regulators and the SEC, paid some fines and made millions. Star has gone through several iterations as a small tobacco company. It began making cigarettes in a former Brown & Williamson factory in Petersburg, and garnered national headlines in the late 1990s after apparently pioneering a curing process that significantly reduced the carcinogens in cigarettes. Later, Williams launched a years-long patent lawsuit against tobacco giant R.J. Reynolds — and won. Star then moved into smoking cessation products, turning tobacco into lozenges, and then dietary supplements. The governor has told WTOP-FM in Washington that he "made friends" with Williams roughly a year or so before he became governor. Even then, Star's troubles were well known. Star Scientific seemed to be constantly spinning its wheels. Searching for the next wonder product, the company lost $18.3 million in 2008 and much more during the next four years. Meanwhile, Williams continued raking in millions of dollars in compensation that appear grossly out of touch with the company's performance. In 2011, Williams' total compensation was about $9 million, including a salary of $1 million, considerably more than the heads of most of Virginia's publicly traded companies. The company has no more than three dozen employees. Star's more recent claims regarding a key substance derived from tobacco called anatabine — it's used in the company's dietary supplements to help with joint pain and in skin creams to prevent aging — stirred controversy earlier this year. Star executives tried to pitch anatabine as having been vetted by researchers at the esteemed Johns Hopkins University. But the claim fell apart when the investor-savvy Street.com news service ran a story Jan. 23 titled, "Star Scientific's Made-Up, Misleading Relationship With Johns Hopkins." Contacted by Style Weekly, Kim Hoppe, director of media relations at Johns Hopkins Medical School, stated: "Johns Hopkins researchers did perform a pre-clinical study of anatabine." She adds: "Johns Hopkins did not review or approve any Star Scientific clinical study, no Star Scientific clinical studies were conducted at any Johns Hopkins location, and no Johns Hopkins investigators were involved in a Star Scientific clinical study." Star spokeswoman Tahlia Tuck declined to comment, referring Style to a news release that denounces Street.com's story as inaccurate. The release also says that the Johns Hopkins School of Medicine never did research for Star. When the Street.com posted its scoop in January, investor reaction was swift. Star's stock immediately fell 12 percent to $2.44 a share. It's about $1.50 a share now. Three lawsuits by shareholders have been filed seeking damages for Star's allegedly misleading research claims. In late January and in February, Star also was hit with subpoenas from the U.S. attorney's office investigating the company's securities transactions dating back to 2006. By late March, news media were filled with stories that McDonnell and Attorney General Kenneth Cuccinelli failed to file timely reports on gifts given to them by Star and its chief executive. For McDonnell, the Star Scientific scandal doesn't make sense. The popular politician is basking after winning remarkable victories such as his road-reform package. He'd been mentioned as a possible presidential candidate in 2016. Now it seems that this low-rent stumbling will ruin his reputation. McDonnell has said that the Post misinterpreted his staff's emails. He claims that Executive Mansion event in August 2011 was to help Star give out research awards to local medical researchers. But there's no denying that Star launched Anatabloc, which it describes as a critically important product, that month. The spotlight seems to keeping following Maureen. She worked for 13 years as an independent consultant for Nu-Skin, a $1.7 billion Utah-based company that runs direct-sell operations for dietary supplements and anti-aging skin creams. She flew in Williams' aircraft to Florida and Utah to promote Williams' products. There are Web comments on investor chats that Nu-Skin, a competitor of Star Scientific, might be interested in a deal which obviously wasn't consummated.